Enjoy an organized workplace with our rotating pipette stand. prevents potential cross-contamination from the stand to the pipettes. 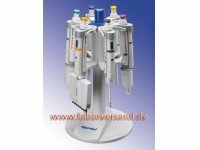 the stand can also hold all older models of eppendorf® pipettes.